Posted on December 11, 2013 by Ronald Patrick Raab, C.S.C. Shortly after I was ordained a deacon, a mother of a mentally disabled man approached me after Sunday Mass. She told me that her son was not allowed to receive communion in the other parishes that they had attended. She begged me to work with her son. She grabbed my attention when she told me that her son was my age. She was a frantic, yet strong mother. Her grey hair was pulled back off her face, her shoulders tight from exhaustion and concern. She introduced me to her son, Dennis. He was extremely polite and seemed so interested in our conversation. Dennis and I discerned his readiness for the Eucharist during the next months with catechists and his mother. After getting to know Dennis, I realized he was teaching me more than what I was offering him. He taught me to really need God, not in an intellectual way, but from the gut. The teacher-student relationship was blurring. He companioned me during those formative months as I learned how to preach and how to lead public prayer. He walked with me through Lent and those last minute preparations for priesthood ordination after Easter. I learned immediately from Dennis that ministry is about people. I learned to form my words as a preacher around the delicate situations people face in life. Dennis taught me to listen to the scriptures in an entirely new way, especially the scriptures during the Lenten season of personal conversion and encounters with God. Dennis was marginalized only because his mind could not capture the intricacies of Church doctrine. However, Dennis believed with his entire heart. I reflect on Dennis’ influence on me as we enter into the Lenten season. These classic gospels of conversion teach me still to be careful how I connect the healing touch of Christ to the vulnerability of people. Jesus did not reach out to concepts, to institutions, to doctrine, or ideas or rules or notions about the Church. He reached out to people who were lost, forgotten, sinful or hurting. The grace of gospel life is still alive in proclamation and preaching. Jesus entered the desert and he was confronted with evil. The journey brought him into the green pastures of authenticity and genuine power. The forty-day desert is a reminder for all of us that renewal is grounded in the grit of sin, division and hardship. The journey toward Easter is not easy for any of us who long for new life. As preachers, we all need to sit by the well in the encounter with Jesus and the woman. We need to hear with our own hearts Jesus telling us everything we have done. We need to listen so that we can interpret the power of Christ’s love among people who come to sit in our pews waiting for the same love and affirmation. We also need to proclaim the gospel of the blind man realizing our own blindness, our inability to recognize the beauty of peoples’ struggles. The darkness of denial is overwhelming for all of us who preach. Really seeing how our preaching is formative for our own lives often eludes us. Jesus’ spittle, the clay of earth, the mudpacks on our eyes and hearts is for us. If we claim we have authority to proclaim Jesus’ words, his actions and his forgiveness, then we must begin in our own dirty uncertainties and the messiness of our lives. Lazarus was bound by death. Martha and Mary knew Jesus could free him. Jesus arrived, unbound his ties to death, gave him new breath and renewed his family’s belief. We so often preach the miracles without ourselves knowing this new life for our own brittle ways. As preachers of Lazarus’ new freedom, we need to walk with people whose voices have been bound by hatred, whose lives confined with prejudice and whose futures petrified by isolation and violence. The freedom of Lazarus is a profound reality for us who preach the magnificence of forgiveness, of new life and healing for people. My Lenten journey with Dennis in my deacon year led me to hear the echoes of suffering in so many confused voices. I preach from the profound understanding that I cannot change people’s pain or hardship. I can offer words of hope only by confronting my own pain. The Lenten scriptures must be proclaimed and lived only from the souls and voices of preachers who know and believe in Christ Jesus. Dennis’ mother and I discussed when the appropriate time would be for him to receive communion for the first time. I invited the two of them to consider Dennis’ First Communion during the Eucharist where I would preside for the first time. Dennis was the first person to receive communion at my first Mass, the Second Sunday of Easter, April 10, 1983. Now as a seasoned preacher, I carve a place in my Lenten prayer to remember all the people who have shaped my ideas about the gospels. I carry with me to the pulpit and to the altar all the voices that remind me that Eucharist is food and grace for real people’s lives. 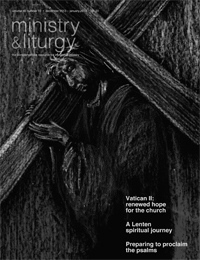 This entry was posted in Ministry & Liturgy Magazine by Ronald Patrick Raab, C.S.C.. Bookmark the permalink.